Unless you have experienced a serious dust storm such as those which occur in desert areas around the world, you have no idea how awesome, and actually dangerous they can be. ‘Haboob” is the Arabic word for these storms, and has been adopted by those living in the Southwest to describe them also. Getting caught in one can be no fun and there are certain things you need to do to protect yourself if you are. These storms are usually the result of air being pushed downward and forward by a storm front. They can move fast and rise as high as 10000 feet. Visibility can be reduced to as little as 12 feet in just a few moments. Living here in Arizona, I have experienced a couple of pretty intense ones. In the United States, these storms are common in Arizona, Nevada, New Mexico, and some parts of Texas. The major dangers of these storms are visibility hazards when driving and respiratory problems. In 2013 one caused a 19 car pile up near Phoenix which killed 3 people and injured 12 others. If you live in parts of the world where these storms do not happen, you need to know a few things when you travel through areas where they do happen. The Southwest is home to some of the best survival schools as well as some of the best small arms training facilities such as Gunsite and Front Sight, and many people travel here for training. When driving through an areas known for dust storms the most common indicator that one is likely is a haziness that is developing in one portion of the sky, often low down. It would be a good idea to turn your weather radio on and listen for reports. If you see a dust storm coming towards you, try to change direction if possible. 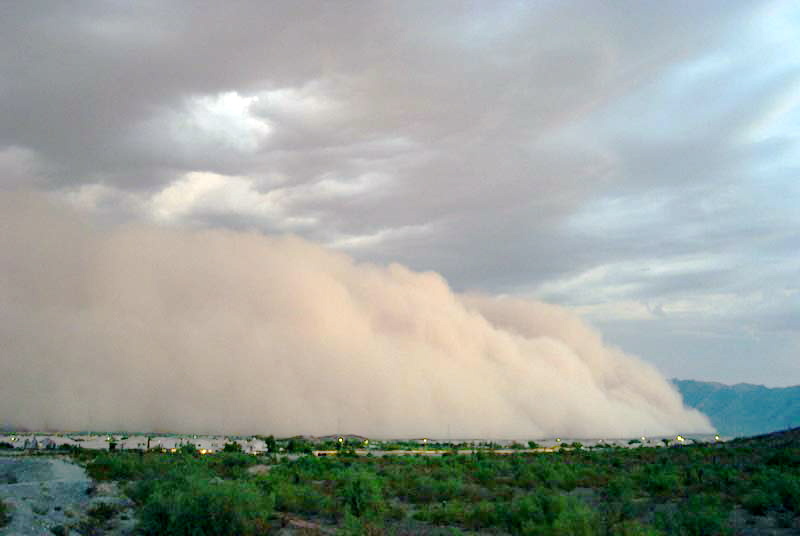 Most dust storms are relatively slow-moving, and you may be able to out run it. If you can’t out run it, pull over. If a dust storm reaches you, visibility is going to diminish rapidly. Pull over to the side of the road, put on your parking brake, take your foot off the brake pedal and turn off your lights. This is important. Vehicles coming up behind you may see your lights, think you are still driving on the road, and slam into you before they realize you are stationary. This has happened many, many times. Stay in your vehicle. reduced visibility outside could cause you to walk over to a drop off, or you could be hit by traffic who’s drivers do not stop. In addition, flying debris can be a danger. The first Haboob I experienced pitted the windshield of my Jeep enough that I had to have the windshield replaced. Most storms will pass quickly. Another danger of dust storms are respiratory issues especially for people with respiratory problems like asthma or bronchitis. If you are caught outside in one of these a good respirator could be important. If you live in an area known for dust storms, a quality dust respirator and dust goggles would be appropriate for you bug out bag or vehicle emergency bag. Surviving a dust storm isn’t difficult if you use common sense and a couple of items of protective equipment. Like shtfprepper I too live in Florida and here they are as scare as hen’s teeth. I did endure several in Saudi Arabia and Iraq during Desert Shield/Storm and they are a thing to see. They do bring operations to a slow crawl or a complete stop. Even though we don’t get these in Florida, I was still curious to know how you dealt with ’em. You never know, right?